I had a girl’s weekend a while back, and found THIS view from our villa at Belongil Beach. 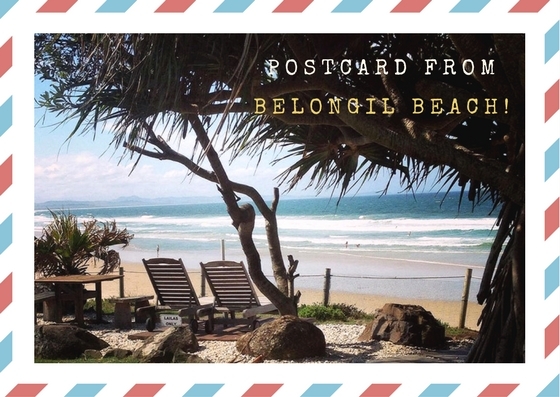 Belongil is a long, white sandy tract well away from the crowds at Byron Bay, but only five minutes drive (or bit of a walk via the beach) from the action. We stayed at Lifesavers villa at Bluewater On The Beach (and yes, that IS the view from our deck) watching whales and drinking in the incredible view. And it’s a great spot for body surfing too. The villas are light and airy, with one double bedroom downstairs and a large loft arrangement upstairs that slept three more. Treehouse is a cool cafe/bar in the same street, with regular live music and great pizza, and there’s an IGA not far away if you want to grab some basic groceries. If it’s chill time you’re wanting, it can all happen here, but party town is just a five minute trip into Byron. I think I belong in Belongil!! You should check it out too.